You can now receive updates on your SSS account via text inquiry with this Text service offered to all members. You can get updates on your loan balance, loan contributions application, disability, sickness, maternity and retirement status thru text. To register, you may for the simple steps provided below with your correct details and info and you can now receive updates right from your phone. 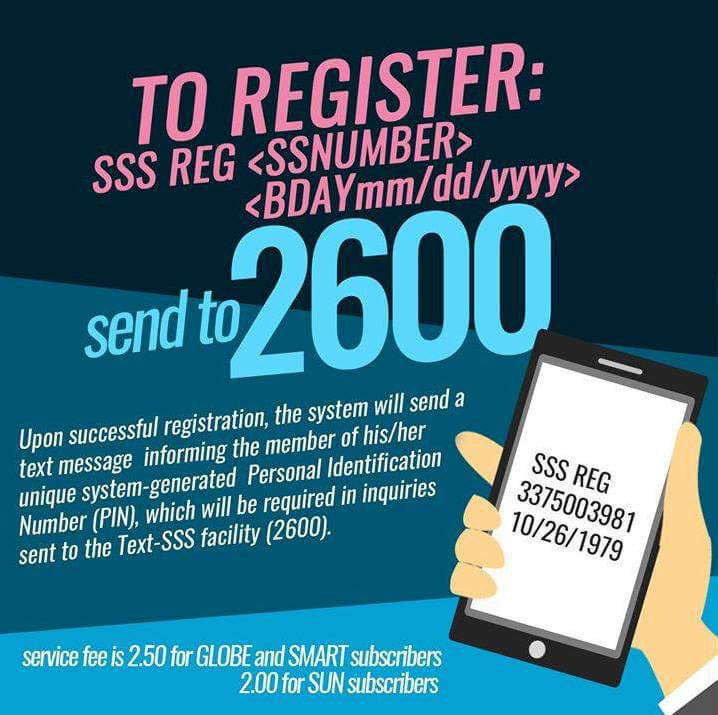 If you don't have internet connection to register SSS online, you can use this method to keep up to date with your account. It's less hassle than going to your nearest SSS branch and wait for a long line queue. No need to spend fare and you can save time. All you need is active mobile number and a smart phone using the SSS mobile app. Text SSS is a text based facility that allows a members to inquire information of their account via SMS. Just follow the format or command below for your reference. How to register SS text inquiry? Just type SSS REG (SSS Number) (Date of Birth MM/DD/YYYY) then send to 2600. Then wait for a reply message from 2600 for the 4 digit PIN. Message from 2600 will be sent you. 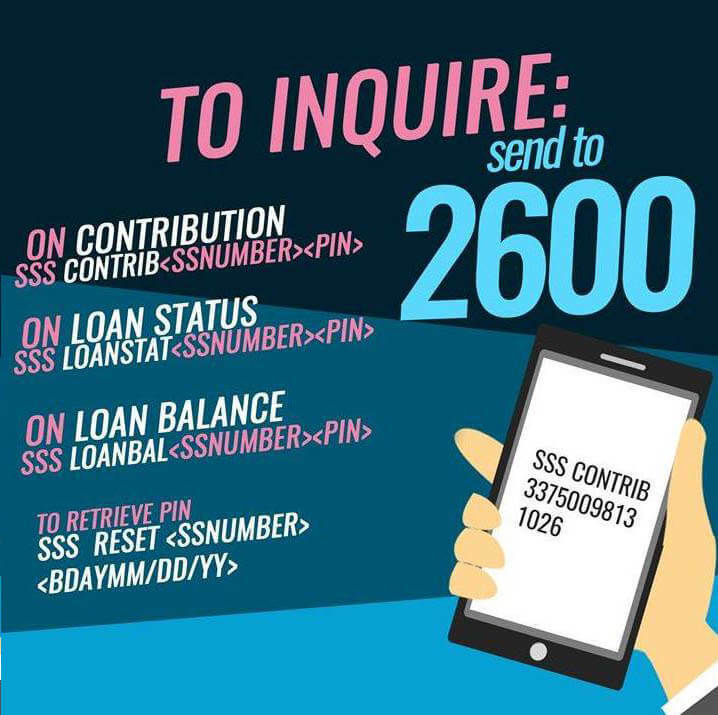 HOW WILL I KNOW IF MY LOAN APPLICATION WERE ALREADY APPROVED BY SSS? hello po how to avail an educational loan and terms of payment. I think it is better if we can directly chat with SSS thru this site for quick response.It benefit the people that are so busy during the day. Reduced the hassle of traveling. Time saving. Hi,' how will I know if I already reached 3 yrs of contributing? Hello, how will I know if my educational loan is already been approved. as of this date of comment, SSS text response is much faster than of their website itself. My office got a response quickly about his contribution update not being posted by SSS itself due to the fact it was sss system posting his SSS loan contribution to his previous loan that is already completed making it overpaid and making is current loan application being under paid. so in-short his current loan application is under-qualified. And infact same as mine. What-da-fact!.. Nkpag loan na po ako sa sickness ko last yir,tanong ko po kung pwede pa ulit ako mkpag loan?